The high-end SilentWings® 3 fan delivers best-of-class airflow yet produces very little noise. This is thanks to its unique, optimized fan blade design along with an advanced fluid-dynamic bearing and 6-pole fan motor that largely eliminates operational noise, has a super-long life and minimal power consumption. The fan inlet of the Straight Power 11 750W is funnel-shaped. It causes an increased throughput of air which benefits to a higher cooling performance. 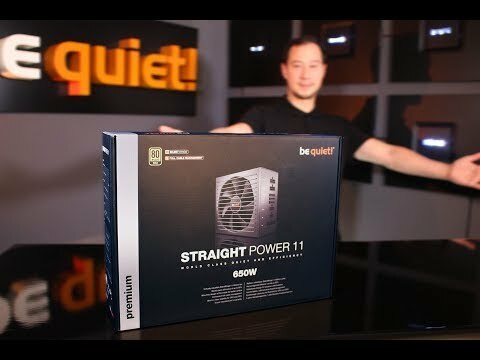 An absolute innovation: The Straight Power 11 750W is wire-free on the DC side inside the PSU body. This results in improved cooling airflow and less signal disturbance, simply because of a lack of wiring, and ultimately pushes the lifetimes of the components to a maximum. Straight Power 11 750W is certified with 80PLUS® Gold efficiency, reaching up to 93%. This gives less power consumption and a cooler and quieter operation. Truly a benefit for any system. The use of LLC and Synchronous Rectifier (SR) provides very stable operation and enhanced voltage regulation. The PSU is equipped with DC-to-DC conversion for tight voltage regulation even under heavy cross-loading conditions. This ensures reliable operation with the next generation of processors and graphics cards. 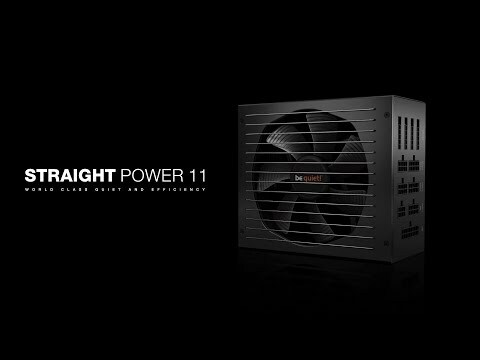 Only the best components are used in Straight Power 11 750W. That is why we have built only high-quality Japanese capacitors into the PSU chassis. They are rated to 105°C, ensuring stability, reliability and a long operating life. Features • Virtually inaudible SilentWings® 3 135mm fan. • Funnel-shaped fan opening of the PSU case for high airflow intake. • Wire-free inside the PSU on the DC side for enhanced cooling and longevity. • Full cable management for maximum build flexibility. • 80PLUS® Gold efficiency (up to 93%). • Powerful multi-GPU support with two PCI-Express connectors. • Japanese 105°C-rated capacitors ensure stability and reliability. • ErP and Energy Star 6.1 ready. 750W be quiet! Straight Power 11, Full Modular, 80 PLUS Gold, SLI/CrossFire, Quad Rail, 62.5A, 135mm Fan, ATX PSU is rated 5.0 out of 5 by 1. Rated 5 out of 5 by WTazV from This product has great features. No problems with this Power Supply Unit, works great and quiet. PSU has nice black sleeved cables which compose with PSU look. A great choice that I will not regret.